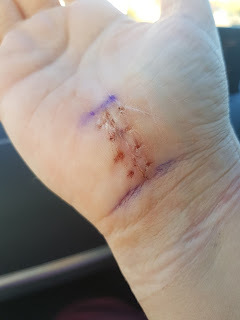 Kitty Rambles A Lot: I Had Carpal Tunnel Surgery.. Twice! I Had Carpal Tunnel Surgery.. Twice! So I've mentioned it a couple of times on my blog before, but the major reason I've been MIA for the last few months is that I've had carpal tunnel surgery on both of my hands. I had the first in November last year, and the second in January this year. It was desperately needed, particularly for my right hand, but it's been a long healing process. I did a lot of googling before my operations to read about people's experiences with it and for a relatively common surgery, there doesn't seem to be much written about it online. I documented as much of the process as I could and decided to my journey here. 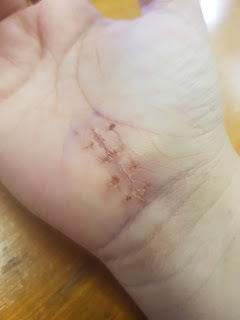 Before I get started, this is your TW/CW for photos of stitches/wounds post op. 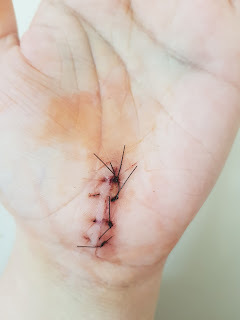 If you don't want to see photos of my hands containing stitches this is not the post for you so I'd recommended skipping this one! 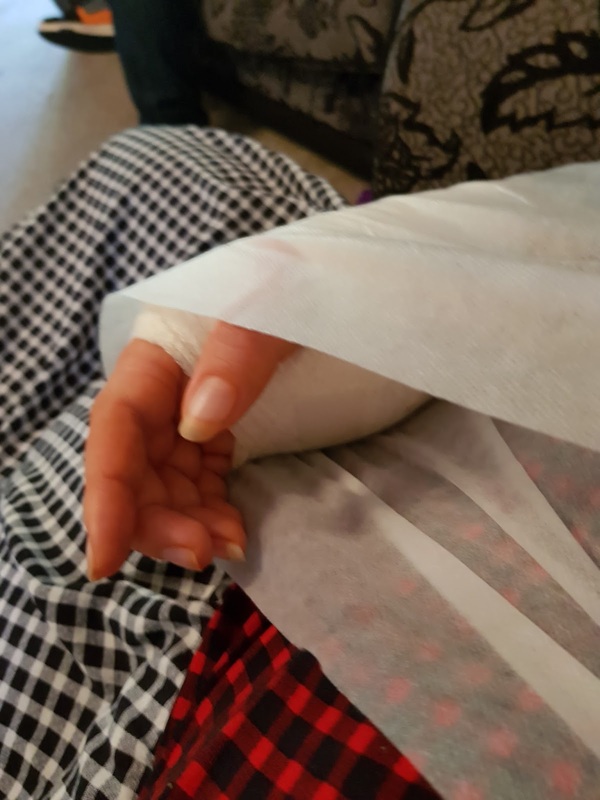 I've written before about having carpal tunnel in this blog post, so I won't go into the details of what having it is like, instead I'm going to focus on the surgery. So, first things first, it is done under local anaesthetic, meaning you are awake for the actual operation. 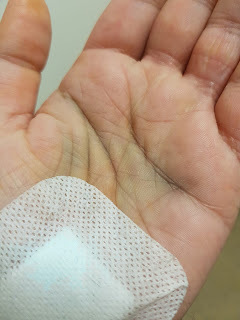 You can't wear any makeup or nail varnish, and all jewellery must be removed (bar a wedding ring so long as it isn't on the hand being operated on, it'll need covering with a plaster though). They are very strict on the nail varnish and makeup and I witnessed two people be made to remove it who turned up wearing it. You'll need to bring along slippers, a dressing gown, cotton pants, and make sure you wear clothes that are easy to get on and off, as you'll be one handed post op and you won't be allowed to have anyone wait with you. I was provided with a hospital gown (nurse very kindly made sure she got me a bigger one and it easily covered me appropriately so I wasn't uncomfortable in it at all). A nurse will double check all your info and pop an identifying band around whichever wrist isn't being operated on, and your opposite ankle. My nurse used two together for my ankle because she didn't want it to be really tight and it would have been. A surgeon will come along for a chat, mark you up for surgery and then it's a waiting game. I waited around 4 hours for my first surgery, so I highly recommend taking books to read, and bottles of water/drink with you. I was allowed to eat as normal and took some food with me and I was glad I did as I was waiting for a long time. My husband Stu was allowed to stay with me for the check in bits but once I'd seen the surgeon all family members and partners were asked to leave. Under your gown they only let you wear pants, so I suggest you make sure they are both big and comfy! I wore my dressing gown over the top so I could walk around comfortably, and only took my dressing gown off for the actual operation. It was SO warm on my ward, so I'd suggest a light one. The actual operation itself does not take long. Once I was called in I was allowed to walk down to the theatre, then I had to take my dressing gown off and lie flat on my back. Your arm goes out to your side on a panel. First thing is the anaesthetic itself which is the worst bit, it pinches and is uncomfortable, but it gets to work pretty quickly. They'll then cover you in iodine (hence the lovely orange tinge my skin has in these photos) and get you prepped. 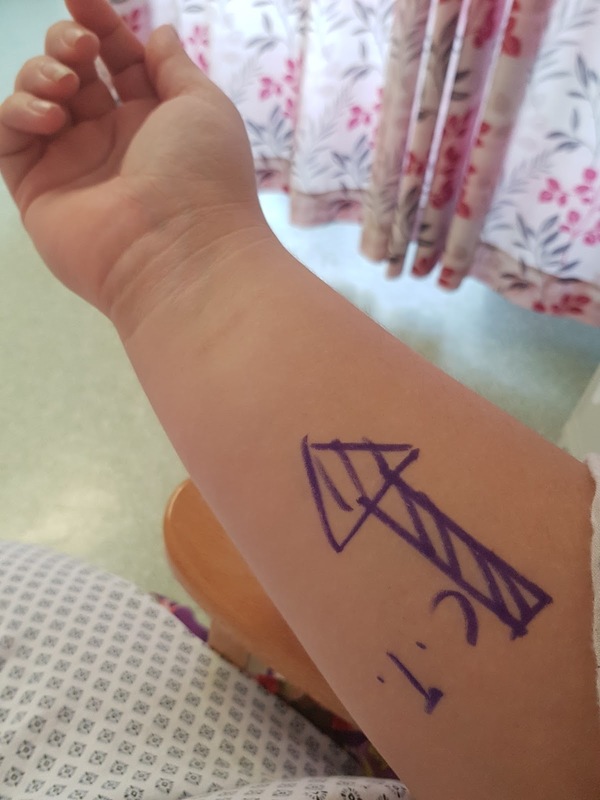 They roll a big tube down your arm to cut off your circulation which is very bizarre feeling too. Very tight and a bit awkward to get on. Once the anaesthetic is working they'll make the first incision. First time round I didn't feel it. Second time round, I did, so told the surgeon and was given more anaesthetic. It wasn't painful when I felt it, but sharp, so do vocalise it to your surgeon if you feel it. It's a weird feeling to know they are tugging round inside your hand, but also being unable to feel it, I won't deny it! 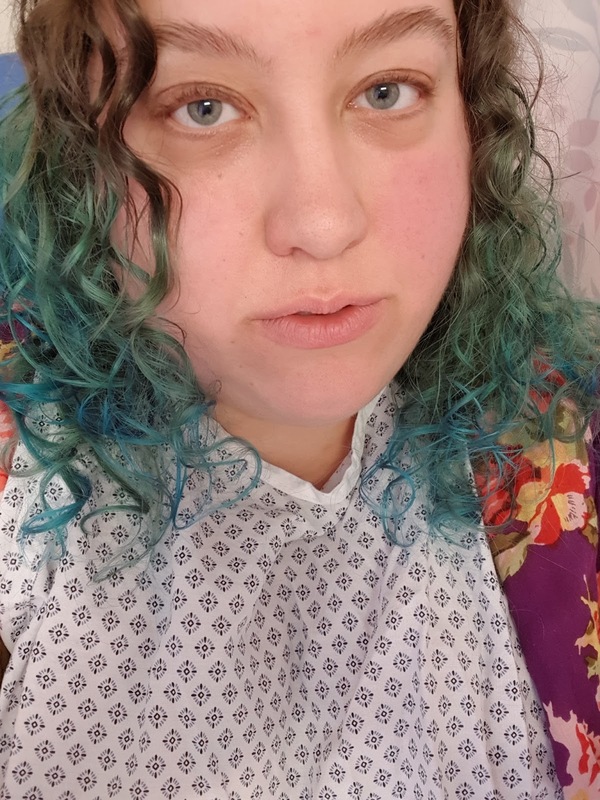 The surgical team were a lovely bunch at Grimsby Hospital and nattered away to me about my hair and my smiley piercing as they operated and made it a pleasant experience. Before I knew it I was stitched up, and before they bandaged me up they asked if I wanted a peek at the wound, which I totally did. Once I was ready it was time to sit up and into a wheelchair to get pushed back to the ward. I was allowed to get redressed as soon as I felt ready, and was discharged about 45 minutes after my operation. I was advised to get Stu to wait in the car park for me rather than pay to park again and as I felt steady on my feet, that's what I opted to do. I was offered tea, coffee or a biscuit too but as I don't drink tea or coffee (I know, I know, it baffled the nurses too), I stuck to water. 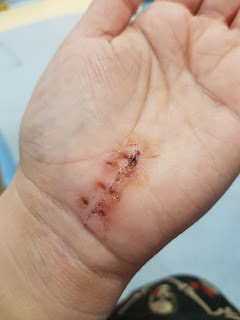 So getting my stitches out was probably the worst bit of the actual operation process for me. The stitches were incredibly tight and it took 2 nurses to get them out of my hands on both occasions. 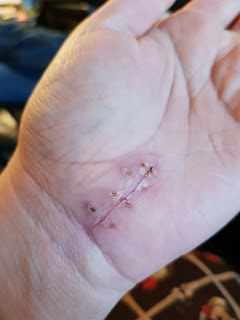 After my second lot of stitches were removed about a week later I also realised that there was a stitch still in my hand. 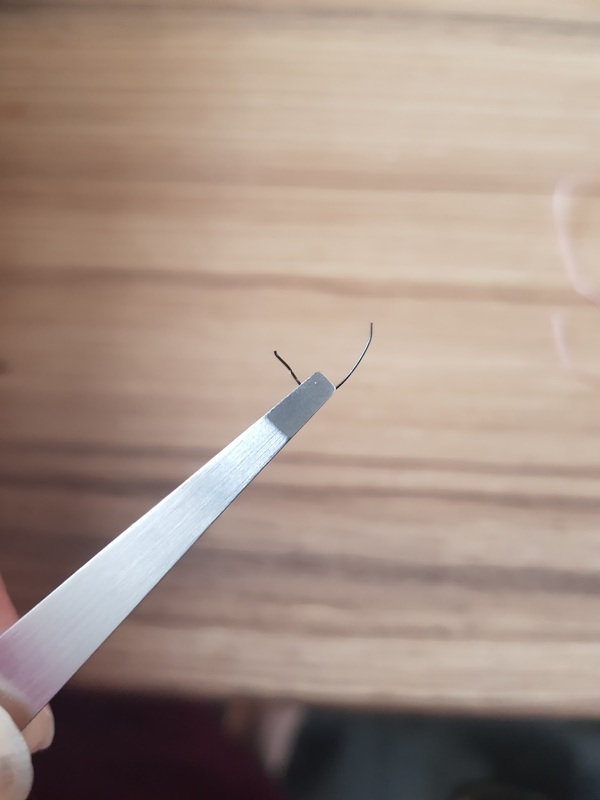 I ended up using a (brand new) needle to remove it myself because I just wanted it out and was concerned about it staying in my hand any long. 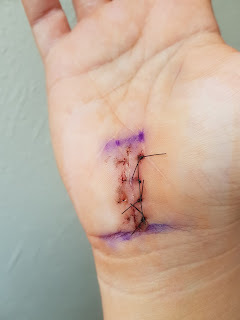 I found having the stitches removed painful, my hands were still swollen and the stitches seemed to have no give in them. Not a fun experience and much cringing was done on my behalf. 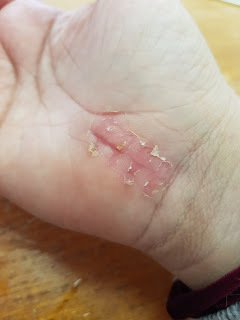 I'm now going to post a bunch of photos of my hands and the healing process so you can get an idea of how they looked as they went along. 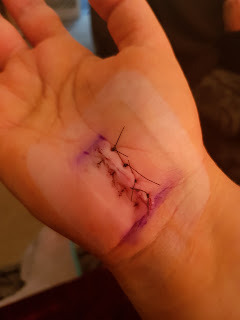 Right hand immediately after removing the bandaging. Right hand 2 weeks post op after stitch removal. One day later. Right hand 20 days post op. 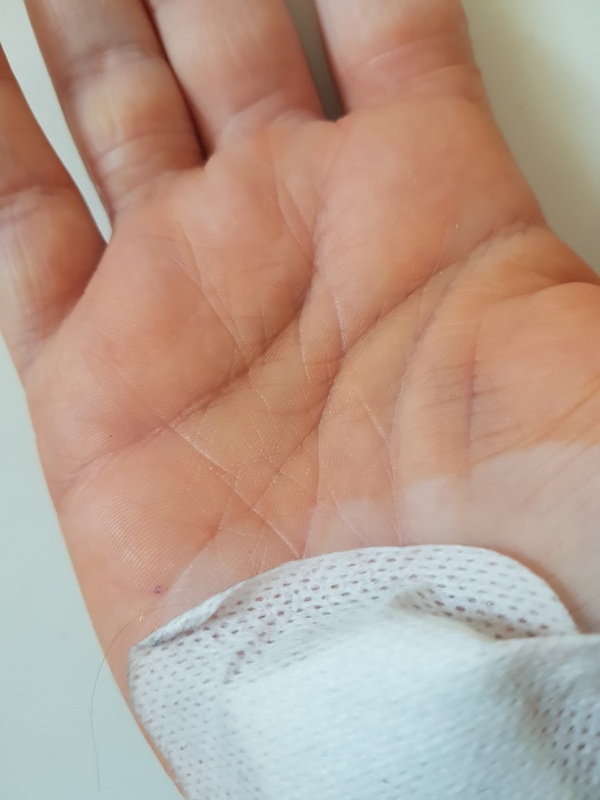 Right hand 1 month post op. 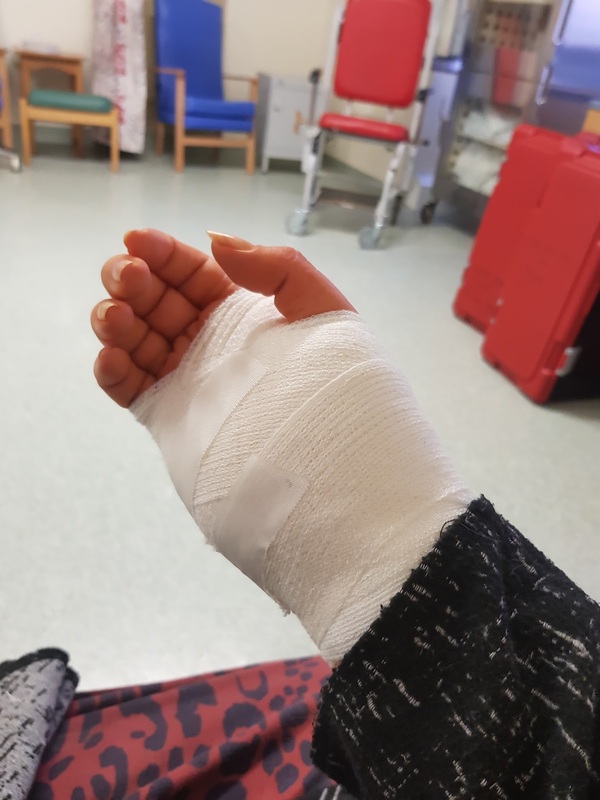 Left hand after bandaging was removed. Note how much more bruised my palm was! Left hand 2 weeks after op after stitches removal. 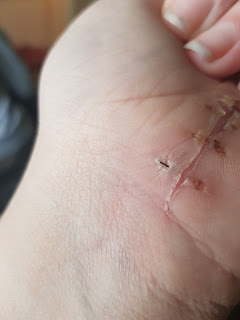 3 days after stitch removal. I found my left hand took a lot longer to heal than my right hand. 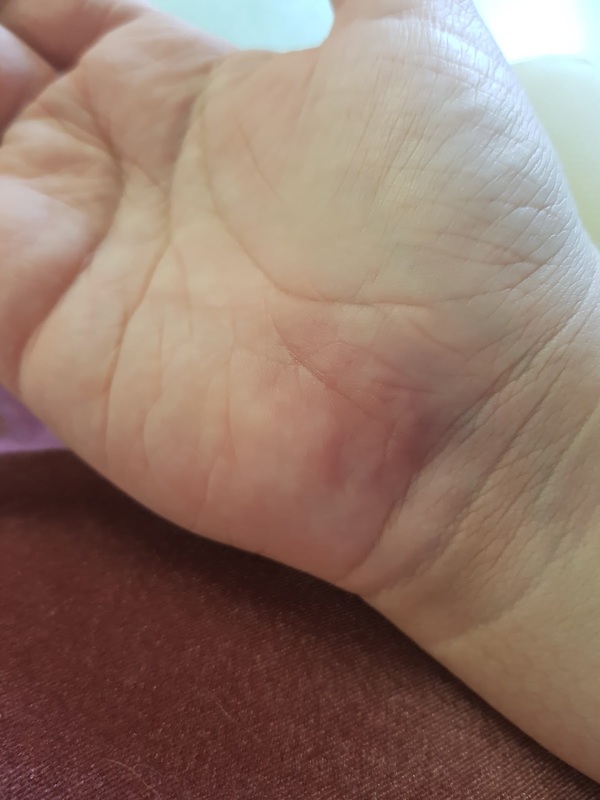 I expected my left hand to be easier because my left hand had less severe carpal tunnel, but for some reason, my left was much more swollen and bruised for a lot longer, and has taken a lot longer to feel better. Only in the last few weeks, 3 months after my second operation, have I been able to open a bottle on my own for example. Gripping smaller objects proved very tricky. Your full pre-op grip doesn't return to you for around 6 weeks post-op, and then you still need to rebuild your strength to improve it. I wasn't given any physio to do but chose to make sure I kept moving my hand and flexing it and gradually building up my use of it. 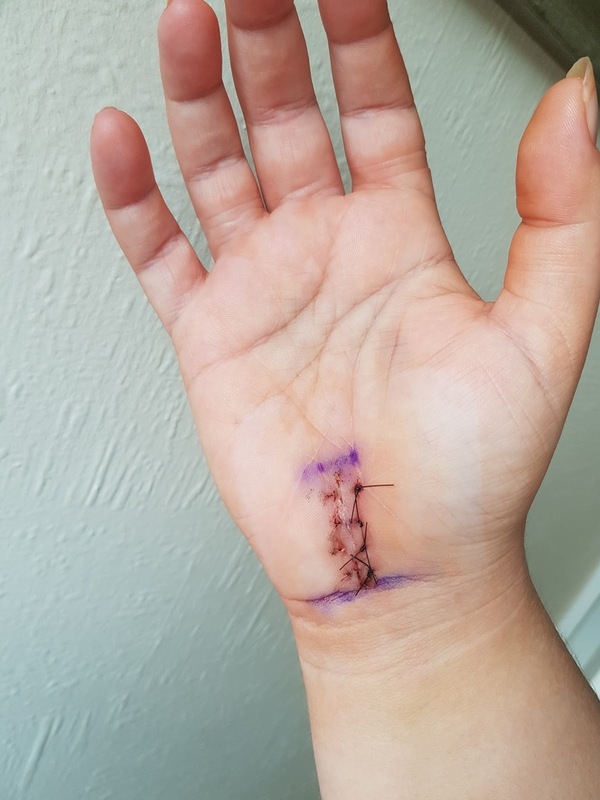 You aren't allowed to drive while you have stitches, but I chose not to drive for about a month after my operation, preferring to listen to my hands. I only drove short distances and built up how much I drove, starting first driving round the block, then a little further, a little further, and so on. It's absolutely key to listen to your hands, and when they hurt, stop. Don't push them. 3 months on from the final operation, 5 months on from the first, I can firmly say that I am so thrilled I had these operations. Before I had them, I was in pain all the time, and since my operation that has completely gone. I have regained all the feeling I had lost in my right hand! I couldn't feel my thumb and index finger at all, and now I can. I can cross my fingers again, I can open bottles, lift things, it's awesome! I do still have to be careful, repetitive movements do hurt my hands and can set me back, so I go steady and listen, if my hand hurts, that's enough. And for anyone who worries about the scarring, this is my left hand, 3 months post-op. The work really hard to try to keep the scar so it blends in with the natural lines of your hand, and I think they've done a brilliant job. My right hand is even less noticeable! If you've been offered the operation and are worried about it, please don't be. I won't lie, it does hurt afterwards, and it does have a long healing time. I had 2 weeks off work and then went back part time, building back up as I felt comfortable, and I'm very lucky to be in a job that could accommodate that. In the long run, it has been so worth it. I can do so many things I couldn't before the operation, and I'm hoping that one day, I might even be able to use my camera again. If you have any questions, do feel free to ask away!